The least costly and least invasive option for replacing missing teeth. 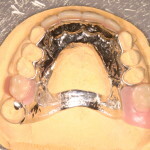 Dentures that are well made and designed can provide excellent function and appearance as well as replace multiple missing teeth simultaneously. Obviously they require some time to acclimatise to their presence in the mouth but they can be very successful in cases where the teeth or jaw bone are not suitable for either fixed bridgework or implant treatment respectively.